This kit was inspired by the raspberry sherbet in my freezer. Summer is my favorite season and I love the bright colors and heat associated with it! Gotta design these bright kits while the season lasts. Already, I'm starting to worry about school supplies. Nooooooooooo. I'm not looking forward to an 8:00 am school start time. Includes: 7 Pattern Papers, 3 stitched frames and branches element. Kara, thanks so much for posting your digi pack freebies. 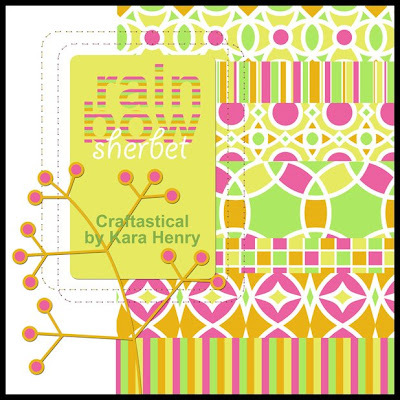 I just love your designs...once I get better at my digi scrappin' I'll share what I've done! Awesome. Love the kit! Thanks so much for sharing! Thank you so much for this Freebie. I want to let you know that I posted a link to your blog in Creative Busy Hands Scrapbook Freebies Search List, under the Kit(s) post on Aug. 12, 2009. Thanks again.